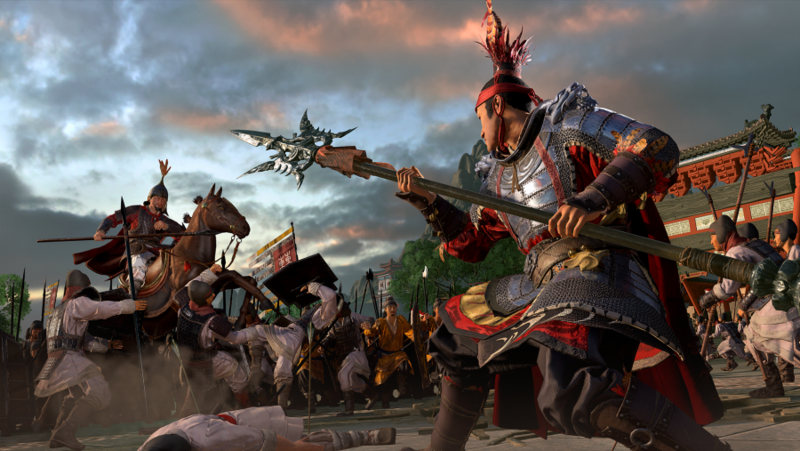 I’m sure Creative Assembly will back me up when I say that in Total War: Three Kingdoms you’re essentially leading a country-conquering boy band. You’re the front man of the faction, providing the look and tone of the group, but your support comes from characterful generals who each bring their own personality. 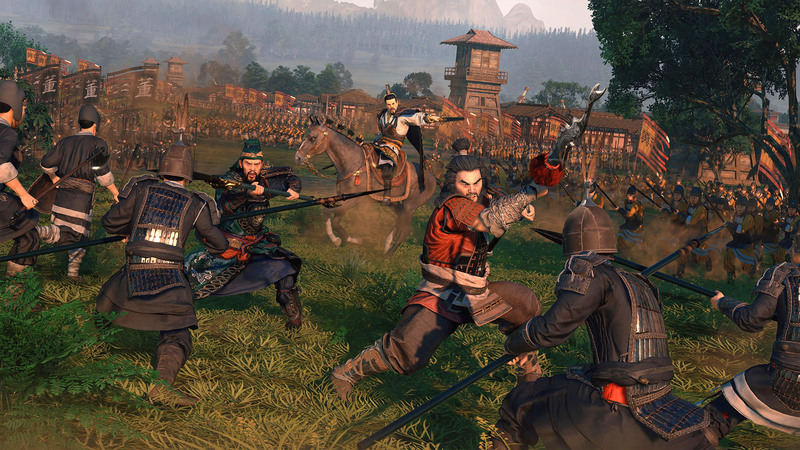 If you play as Lu Bei, you have Zhang Fei, the heavy-drinking, spear-wielding wild card. Whereas, Guan Yu – famed for his “peerless beard” – is the one all the mums love. As with any boy band, the membership can change over the years. If you have a falling out with one of your generals then they might join another act, or do a Robbie Williams and start a solo career. Many things can drive a split: it might be because of choices you make in the campaign, or differing personal philosophies, maybe you just can’t stand Mark Owen anymore. As we learn talking to writer Pete Stewart and senior designer Leif Walter, the impact of this revolving membership can radically alter you campaign across different playthroughs. 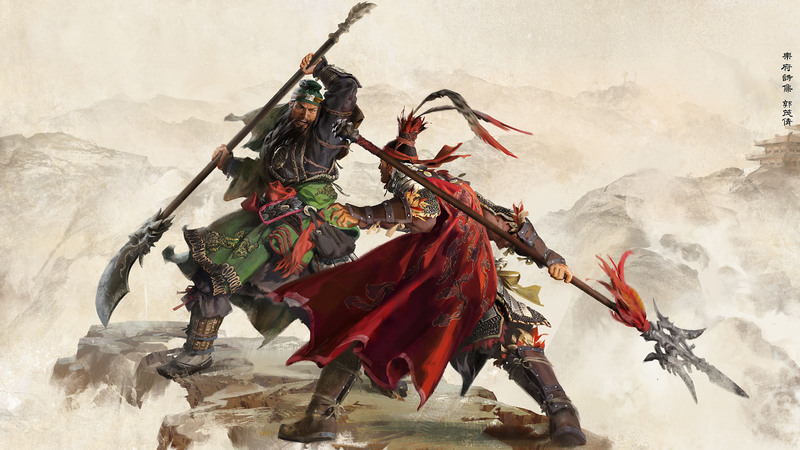 PCGamesN: Alongside the military conflict of the Three Kingdoms, there was a philosophical one too, as competing warlords espoused competing ideas in Legalism, Confucianism, and Daoism. Is this reflected in your game at all? Leif Walter: If you look at all the great heroes in our game like Liu Bei and Cao Cao, they don’t really have big differences in terms of philosophy, or belief, or religion, they are all part of the the old regime to some extent. It’s more about political power, and about personalities – one is driven by virtue, the other one is driven by hunger for power, and it’s more about these worldly differences between them. In diplomacy you will find how these personal differences feed into [the relationships system]. You’re reflecting the Romance story in these starting dilemmas, which are taken from the novel. Is that carried through into the rest of the campaign? Pete Stewart: There’s sort of two elements to it. We have elements from the Romance or from history that we know did occur, and it might be that you play through a campaign and you don’t get the specific constellation of circumstances to create that moment. But if you do happen to recreate a moment from the Romance, or even from the Records [of the Grand Historian], you’ll get an event that pops up to represent that. So it’s a neat little thing to find that you’ve somehow, just by chance, or by deliberate action if you really know your history, to make it happen. Walter: Yeah. Taishi Ci was captured after battle multiple times – three, or seven times even, by Cao Cao – and Cao Cao lets him go all the time. Eventually Taishi Ci is like, ‘Wow, you must be so honourable as you let me go all the time! Let me serve you because you are clearly the greatest leader’. So this was one cool example where we thought ‘Yeah, we need some gameplay mechanic where people can create this or similar stories’. 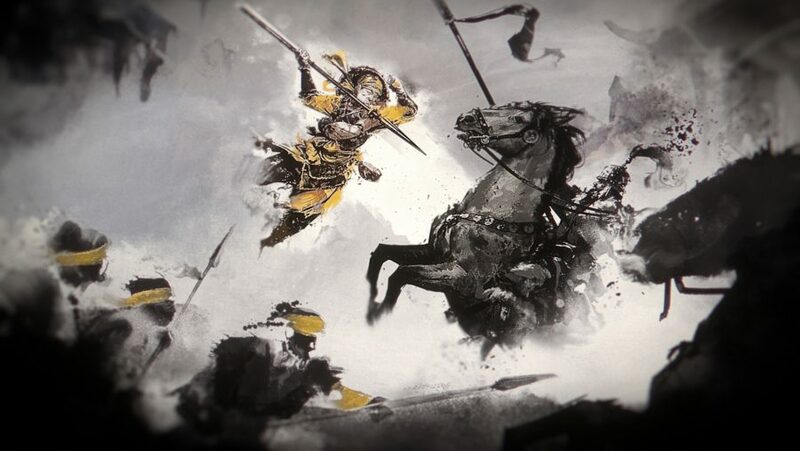 Maybe not between Taishi Ci and Cao Cao, but between other people where their traits and personalities allow this to emerge, then you have this unfolding dynamically in your campaign. Stewart: Like you’re making your own Romance, or your own histories of The Three Kingdoms. So you’ve written your own original events that might be triggered by particular circumstances? The closest thing to a strictly good guy in Three Kingdoms, Liu Bei is a paragon of honour. Treating his enemies with dignity and respect, even letting captured enemy generals go free - despite the threat they pose to his bid for rule. Stewart: We have our own bevy of events. Quite a lot of them aren’t necessarily triggered by specific circumstances, though some are, and some of them just occur as you play. But then the thing that Leif was talking about with Taishi Ci is part of the Guanxi relationship system. Post-battle, if you capture a general, you get to choose what to do with them – you can take them into your service or just keep letting them go, and then you may see them again and again and again. You may ultimately get to the point where they’re so dissatisfied with their own faction that they think, ‘That guy keeps letting me go, he seems like a benevolent sort – maybe I’ll give him a try instead’. Liu Bei’s campaign is introduced by a lovely, painterly cinematic. Do these occur during the campaign, too? 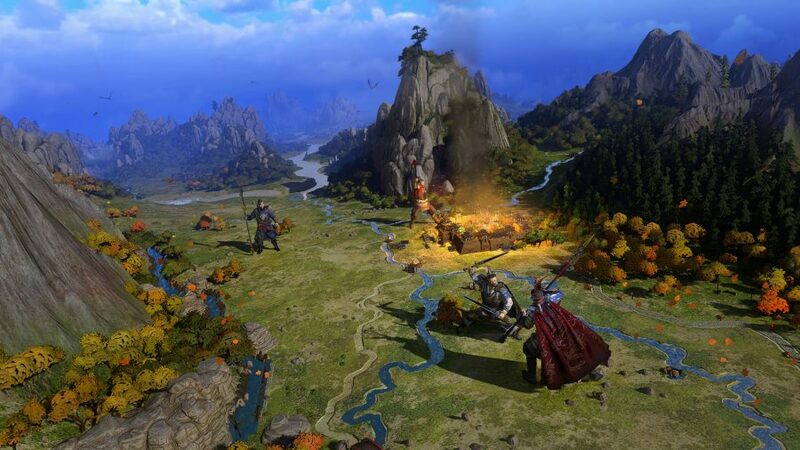 Walter: Even though it’s a sandbox, there will be that pivotal moment where it shifts to the Three Kingdoms period, where three Emperors have emerged and are fighting it out together. Once these three Emperors are on the map, that’s a pivotal moment where one of these cutscenes would play to help deliver the story. Stewart: You’ll know in that moment that the narrative and the game has shifted gear. What exactly what will happen when the player declares themselves Emperor? Walter: The campaign is about getting the prestige to proclaim yourself Emperor, either through conquest or other means. Other leaders and followers will react to that and say, ‘Wait, I’m the real Emperor of China, and I should wear the crown!’. Then you have these three power blocs between the three Emperors, and all the smaller factions will now align themselves. So then it’s not just about factions, but rather these Emperors with their vassals. Then we wanted to avoid the endgame slog, so rather than just having to crawl through two big factions, it’s really about capturing the seat of their power, their capital. You basically dethrone them, and once you do that these Emperors are no longer Emperors, they’re humiliated. Then they might even abdicate and surrender to you, to create a more dynamic and faster paced endgame. What situations can this create? Walter: It’s quite cool how it has ripple effects through diplomacy. Let’s say you have this faction who’s allied to you, but once you become the Emperor you can’t really be on the same level – the air gets thin at the top. So you might find that your ally either has to say, ‘Ok, I’m going to surrender to your rule’, or he’s going to fight against you. We all remember the slight annoyance in Shogun II when you had your allies and then at the end, ‘They’ll turn against me it’s not worth it to have allies anyway’. In [Three Kingdoms] they might actually say, ‘our personalities match, we might be personal friends, so yeah I support you as Emperor now. We’re not on the same level but I will submit to you and be your vassal’. That’s really cool, that you can have these loyal companions. I think that’s very nice. Stewart: But declaring yourself as Emperor is a big step in terms of everything that’s going on in diplomacy. So you have your loyal friends that you’ve been trading with, or supplying food, or having been allies for a long time – that’s great, and you know you can count on their support to come to you. But some of those more tenuous trade routes, that have just been been helping you get a bit more money – what’s gonna happen to them? You have to consider these things, because you’re having to go into two massive wars, essentially, to call yourself Emperor. Can an AI faction declare themselves Emperor? Stewart: Yeah, they can declare before you. Walter: You can have three Emperors on the map and you’re not one of them, so you have to dethrone them. Stewart: Then there’s the question of who will you support for the time being? You can sell yourself to an Emperor and then see how you go from there. Does declaring yourself Emperor change anything else? Does it unlock new units, techs, or characters? Walter: Yeah, there’s some cool endgame units that unlock once you’re Emperor. You can lose access to these units if you cease to be an Emperor. But that’s a nice reward – they’re quite strong, they’re Imperial guards, basically. Then in diplomacy, you have the option to take others into your power bloc. It’s called Heavenly Alliance, where you are the clear leader of your power bloc. Yeah, so there are nice rewards if you’re Emperor. Was it difficult as a writer to capture the styles and the tone of the period? How did you go about that? Stewart: Every Total War title has a copious amount of research before you even start putting pen to paper. But with Three Kingdoms particularly, we’re dealing with a different culture to our own. So you get down to the detail work and you do all the research, and then you consider not only the historical facts but like you say, the tone – how these people speak, how they might act. That’s where, helpfully, a bit more of the pop culture sort of research comes in. The dialogue in the Romance mode is a little bit archaic. It’s an ancient epic from the 14th century, so we couldn’t really write the characters exactly as they are there, because it would seem wrong in a contemporary game. Things like John Woo films – Red Cliff – that kind of stuff is a better benchmark for looking at how they might talk to each other. It’s still quite high-flung language, high romance, but it’s also a bit more contemporary, kind of blending those together. It’s definitely different than writing Rome 2 or Attila, where it’s very easy to get into a Western mindset. You also have characters like Zhang Fei, who is a bit of a thug compared to the more noble Liu Bei, so you have to differentiate tone within a tone. Stewart: Sure, yeah. You take the archetype of the character before you start – so Liu Bei is the closest thing you’ll get to a good guy, he’s the protagonist of the Three Kingdoms in a lot of ways. Somebody like the big boss of the game, Dong Zhuo, is definitely the bad guy. But then someone like Cao Cao is somewhere in the middle – he’s quite wily, quite manipulative, but ultimately he thinks he’s doing – well, he is kind of doing the right thing, just in a bit more of an underhanded way than someone like Liu Bei. But Liu Bei as you might hear from some of his dialogue, and the way he talks through the game, he’s always talking about the people, and always very kindly, very generously. Whereas Cao Cao is always talking like he’s considering the moves ahead. He’s less about the human aspect. Walter: You have these obvious challenges where, let’s say Liu Bei – who was generally a benevolent character – you still have to write dialogue for him facing his nemesis. There’s a certain amount of, not aggression, but conflict in the dialogue. All of these narrative systems have to cater for all the emergent situations that can happen in the game, based on your actions. Stewart: Yeah, an incident happened a month or two ago where we were just doing some testing, and I got into a battle, and Liu Bei will just be using one of the generic scripts that most generals can use. And I think he said something like, ‘I’m going to cut out your heart’, and I was like, ‘I don’t think Liu Bei would say that! I’m gonna go make sure he doesn’t say that anymore’. So yeah, once you’ve done it, you have to tweak it and make sure that everyone is represented like they would be in the history. Characters can become rivals or even nemeses after meeting multiple times in combat – how is that reflected in the game? Walter: Characters are the core of the game so these relationships have an impact in various areas. 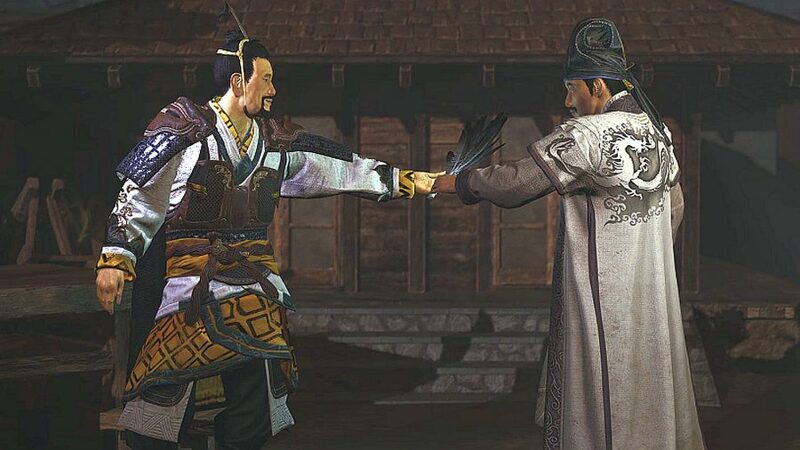 If that character happens to be another faction leader, for example, then being a friend or enemy with another faction will have an impact on diplomacy. You can even build a friendship with a faction leader you are technically at war with. So these rivalries don’t manifest as specific traits, it’s just a relationship modifier? Walter: Yes. But how these relationships develop depends a lot on traits. If I’m Loyal, then I might really relish this trait in other characters, or despise someone who’s Disloyal. But that’s not the only thing, there’s also a battle impact – like when two rivals meet on the field, they’re going to have certain effects because they’re more driven to kill each other. Stewart: The three brothers here [Liu Bei, Zhang Fei, and Guan Yu] have such a strong bond that they perform better in battle when they’re fighting together. And like Leif says, if you have a nemesis on the other side of the battle who you’ve been hating for years, then you will equally have a battle buff based on that. And then on the campaign side, if you bring someone into your faction and they have a rivalry with another person it will affect their satisfaction. They may end up leaving the faction because they can’t stand to be in the same space as this particular character. Walter: So fostering these relationships is very important to make sure you want your faction to be happy. If you happen to recruit the arch nemesis of your heir, that’s going to cause political problems – they might even rebel against you, causing a civil war.